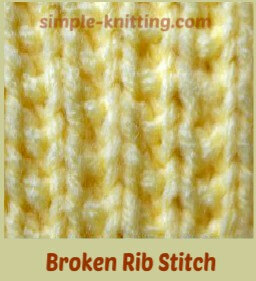 The broken rib stitch pattern is really fun and super easy to knit up. And this makes it a great stitch pattern for beginner knitters too, so grab some yarn and needles and let's get started. Basically, the broken rib is made up of one knit row followed by a 1 X 1 ribbing row so the ribbing is actually broken up and creates this lovely stitch pattern. One thing to keep in mind is that it's not as stretchy as a regular ribbing stitch so make sure to knit a swatch. The broken rib will look absolutely beautiful on anything. haha Try using it for sweaters, shawls, scarves or hats. It is also a great stitch pattern for blankets and pillow covers. It's really eye-catching. The hardest part is deciding which side to use as the right side. This is the front view. You can still see the ribbing pattern stitch a little but by purling that second row it just makes it so pretty doesn't it? But you have to see it on a bit swatch or a scarf because it's really eye catching. And this is the reverse side. It's such a nice nubby textured piece of fabric. And I only discovered recently that this pretty stitch pattern is called the rice stitch as well. This side is just as lovely as the right side too. Hmm, does it look like rice to you? 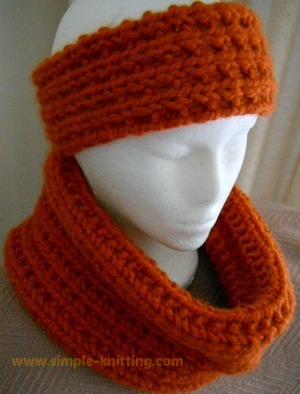 These 2 simple rows create this pretty stitch pattern. You can knit the rice stitch two ways. 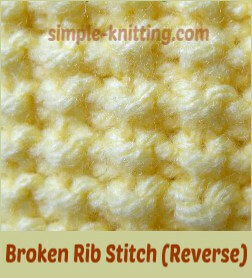 You could just knit the broken rib stitch pattern and use the reverse side. Or use the stitch pattern below as well. For me...I'd probably work the stitch pattern below. Note: Here's a really quick and easy tutorial on how to knit through the back loop. These 2 rows create rice stitch pattern. This is such a versatile stitch pattern making it wonderfully easy to incorporate into your knitting. 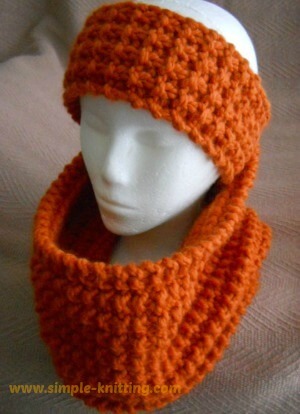 And because I like it so much I made an easy knitting pattern so that you can practice. And it's in a pretty autumn color too. The broken rib stitch pattern is the left picture and the reverse side (the rice stitch pattern) is on the right. I think it's so pretty.